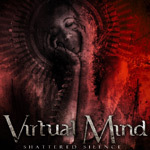 VIRTUAL MIND sprung from the mind of Italian guitarist Francesco Fareri. The idea is to mix heavy metal and a progressive style on their debut album. Apart from Francesco the band consists of well travelled vocalist Titta Tani (ex. DGM, ex. ASTRA, ASHENT), drummer Dario Ciccioni (TWINSPIRITS, KHYMERA etc. ), and bass player Emanuele Calvelli of NOUMENO. The band is quite fresh on the market, and so is Lion´s effort with all-digital releases. After hearing the first four tracks I start to question the existence of the band. The vocals seem to be the stronghold but the refrains are not very memorable and they seem adamant to relive the nineties. Not until track five, “The Door” the band displays their might with some RUSH-like antics. The drumming is heavy, they vary a lot and their progressive touch seems to be in the driver´s seat. But the best is yet to come. “After thy Soul” is a piece of grandeur. From the high-speed opening via various paces, all in gloom, they show why they were probably signed in the first place. Album closer is also a track they should have opted for as an opener. “A Perfect Union” may be a true description, since it has so many advanced movements and depths. Or perhaps they should have named “Too Late”? I don´t know why they kept all the lame tracks of the first part of the album, they seem capable of so much more. I´ll say average for now, but with some thinking and writing time this lot will be talked about in prog circles.